Magnesium bioavailability is limited. That’s why Milk of Magnesia or magnesium citrate is helpful in a certain condition of the bowel. Thank you so much for clearing this up for us. Of course, each answer often leads to further questions. Can you point us to papers and/or articles that give more details re this dying low-mass star heavy element production pathway? This is technically known as the slow neutron-capture or "s"-process. A place to get started is the wikipedia page for the s-process. StarRolf wrote: This is a great chart, but unfortunately frustrating for a colorblind person like myself. 'Big Bang fusion' and 'Merging neutron stars' are very difficult to distinguish, at least on my monitor, as are 'Dying low-mass stars' and 'Exploding massive stars.' I have this same problem with other charts I see online. It would be nice if a better way of displaying data could be found, or at least better color or texture combinations. Here, try this one. It's definitely not perfect, but it should be at least a little easier to read. It could certainly use a redo. The Cosmic Ray Fusion boxes look nearly identical to the ones that are kind of gray colored and not even included in the key. It would be impossible for you to realize that Tc, Fr, Ra, Po, At, Rn, Pm, Ac, Pa, and Np in fact have no label at all. Thanks! This looks a lot better! Color is a fundamental way of displaying data, and works well for most people. It is probably not realistic to expect most graphical data presentations to accommodate color blindness. There are, however, numerous browser plugins which will dynamically reassign colors based on your color blindness type. I'd suggest installing one of those, which will probably make your browsing much easier. Thanks for the suggestion! I am trying Fresh Eyes for Chrome. I can toggle it on and off and have different filtering options. This could be a very handy tool for me going forward! Whenwill scientists announce that the universe is much older than initially thought? Surely information contained in this table means that several cycles of explosion and forming dust clouds and new stars and exploding again had to take place just to make all the elements found on earth. So the big bang can not be the beginning but an event in a long chain of events that happened over hudereds (or thousands) of billons of years, not so? Santa6 wrote: Whenwill scientists announce that the universe is much older than initially thought? Surely information contained in this table means that several cycles of explosion and forming dust clouds and new stars and exploding again had to take place just to make all the elements found on earth. So the big bang can not be the beginning but an event in a long chain of events that happened over hudereds (or thousands) of billons of years, not so? Several cycles of star formation and destruction have occurred to create all the elements. All of them after the Big Bang. That's right. The more massive a star is, the shorter its lifespan, so several generations of massive stars can come and go even in a billion years. More than 13 billion years of star formation is an immense span, plenty of time to have produced everything we observe. I remember seeing a Hubble (or Chandra?) picture of a supernova remnant, and the caption said that we can be sure that this is the remnant of a massive star and its core collapse. And the reason why we can be sure of that is that the remnant contains so much oxygen, and oxygen is produced in core-collapse supernovas. And indeed, today's chart says that oxygen is produced almost exclusively by such supernovas. I also remember reading about red giants and all the chemical processes that go on in them before they shed their outer layers altogether and turn into planetary nebulas and white dwarfs. The text where I read about that said that many elements are created here because neutrons are incorporated into the nuclei of other elements. 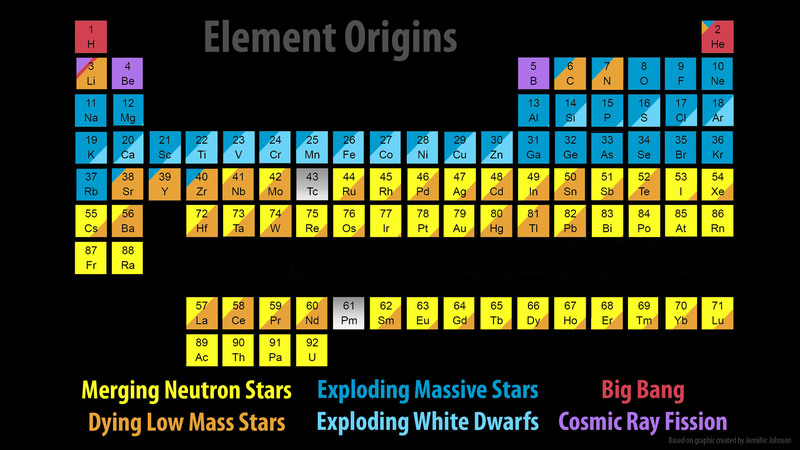 If you check out the chart, the "green" elements (green because they were created by low-mass stars) seem kind of weird. There are few well-known elements among them, apart from lithium, carbon and nitrogen, and the highly poisonous elements mercury and lead. Fascinatingly, though, some silver and even some gold is apparently made by dying red giants! As I understand it, dying small stars lack the needed temperatures and pressures to create anything even as heavy as iron; and their planetary nebulas will be full of oxygen (which is not to say that supernovae do not produce a lot of oxygen themselves). In fact, in that other APOD that I referenced, Sulfur was as heavy an element as small stars could create. However, this arrangement seems to come from the LIGO-VIRGO collaboration or someone close to it. See http://growth.caltech.edu/images/gw1708 ... -table.jpg, which is associated with http://growth.caltech.edu/news-gw170817.html. If this is a mistake, it was made by someone who should have known better. One of the people who put the graphic together here. The heavy elements (=beyond the iron peak) are made by capturing neutrons onto "seed" nuclei, such as iron. Neutron capture is needed because the electric repulsion between a nucleus like iron (26 protons) and an additional proton is very strong, but between a neutron and an iron nucleus there is none. Dying low-mass stars can make heavier elements not because they reach very high temperatures, like those needed to fuse silicon towards iron, but because nuclear reactions happen in these stars that create free neutrons. These neutrons can then be captured by iron (for example) nuclei that are in the star not because they were formed in the star but because those seed nuclei were in the gas out of which the star was born. The Sun has iron nuclei in it for this reason. These neutron-capture reactions are not important for creating energy in the star, so when we discuss nuclear fusion in stars, this process is rarely mentioned. For the origin of the elements it matters! And it has been spectacularly demonstrated to be correct, as we have seen newly-minted technetium in these dying low-mass stars. Because the longest-lived technetium isotope has a half-life of 4.2 million years, much, much shorter than the lives of these stars, any technetium in these stars must be made there, rather than being in the natal gas. I just stumbled across this, albeit months later. The response make a certain degree of sense, except for one thing: Small stars cannot make iron via nuclear fusion! And yet iron is being cited as the "seed" nuclei for the s-process. So this response, as-is, does not resolve my concern. However, I also see an "out" for this: The primary neutron-creating processes involve a Helium nucleus (or alpha particle) and either 13C or 22Ne. And there are paths for the s-process to create iron starting even with carbon. (In fact, an s-process path to and beyond iron exists for 9Be.) So now I have a new concern about the chart: It seems that all of the elements between carbon and iron are subject to nucleosynthesis via the s-process, but that dying low-mass stars can do this is not being accounted for. Maybe this is just more of my ignorance, but if so I would like to know what the right answers are for this. I think you missed the highlighted (by me) part of his answer. Chris Peterson wrote: That is the worst possible reason. A logical fallacy of the highest order. I call it the Billiard Ball Fallacy: the belief that the Universe must work across all its scales in the same way that we evolved to sense and understand the tiny little bit we can see. In fact, when we look beyond our primary senses, we do see things without cause (e.g. particle decay) and things that come from nothing (e.g. virtual particles). The Universe is apparently quite comfortable with these concepts. Indeed, in most contexts, invoking common sense most certainly is a logical fallacy. Partical decay is without cause? The timing of one particle’s decay is unpredictable, but reason for (or in other words, cause of) its decay are laws governing the behavior of subatomic particles. The fact that we can apply a statistical rule to something does not create a cause. The fact is, nobody has been able to identify a cause for particle decay. The event happens, but no precipitating factor appears to exist. I would also argue that virtual particles are coming from something that caused them to come into existence. You may argue that all you want, but it doesn't change our physical understanding of the process, which is that there is neither a cause, nor a "something" that they came from. Entropy is one of the fundamental forces of our universe and the Second Law of thermodynamics states that it will never decrease spontaneously. Also, it is only inferred that the Big Bang was "The" beginning or that it is the result of nothing. Realistically speaking, "nothingness" has never been observed and thus most likely is a product of imagination in the absence of that which we cannot observe or test. Last edited by Martin on Wed Apr 18, 2018 7:54 am, edited 1 time in total. BDanielMayfield wrote: “There is no good reason to assume that something can’t come from nothing,” How about human experience in which we never see a cause an effect that didn’t also have an effect a cause? That is the worst possible reason. A logical fallacy of the highest order. I call it the Billiard Ball Fallacy: the belief that the Universe must work across all its scales in the same way that we evolved to sense and understand the tiny little bit we can see. Partical decay is without cause? The timing of one particle’s decay is unpredictable, but reason for (or in other words, cause of) its decay are laws governing the behavior of subatomic particles. I would also argue that virtual particles are coming from something that caused them to come into existence. Well, black and white has to do with illumination. Imagine an immaculately white sheet of paper versus a black cat. Put them in the same room. Now somehow manipulate the illumination of the room so that terribly few photons are directed at the sheet of paper, while a absolute torrent of photons are sent toward the black cat. It would not be hard to make the cat look "whiter" than the sheet of paper if you could manipulate the illumination of the room that way.